Useful blog on How to Object to Planning Applications. “The Mayor has no role in the determination of planning applications, which is a non-executive function”. Statement to us from Planning Director David Hughes (30th Jan). Mayor Joe Anderson may well oppose the tree loss, but Redrow’s planning application for Sefton Park Meadows (Land at Park Avenue) is still going ahead, and public objections need to be submitted, as advertised, by 19th Feb.
“.. Redrow have informed me (29/01/2015) that they will be making amendments to the planning application 15F/0110. They informed me they will be submitting an amended proposal for the Planning Authority’s consideration. PLEASE CONTINUE TO SEND IN YOUR OBJECTIONS TO REDROW’S DEVELOPMENT. See previous Post ‘Briefings 2’ for all details on how to object, who to send to and helpful points you may want to include. We have no details of any new timescales so please stick to the 19th Feb deadline. The Public Notice in the Liverpool Echo was published as expected on Thurs 29th Jan, giving 3 weeks for objections. It is also important to include that you want to be consulted on any new amendments or a new application that Redrow may make. The Council will then have to send you details of these once they are available for you to object again if you wish. A new planning application may involve the removal of fewer trees. However, this does not alter the fact that the Meadows will be lost forever. We continue to say NO to REDROW! and any development. Our planning consultant will be submitting a first draft of his report to the campaign group within the next few days. THANK YOU TO EVERYONE WHO MADE THEIR OPPOSITION TO THE LOSS OF TREES KNOWN TO JOE ANDERSON. WE HAVE WON THIS PART OF THE CAMPAIGN, BUT IS THERE MORE TO COME? At a live interview with Chair of Meadows Campaign Ken Aspinall with Radio Merseyside on 28th Jan, journalist Mairead Smith confirmed the news that Mayor Anderson was publicly opposing the Redrow Planning Application because of the loss of 27 trees in their plans. Is sense at last prevailing in the Mayoral Office and amongst Cabinet members? Has Joe been to the Meadows again with his grandson and realised the devastation that he would personally be responsible for? We know that at last Labour members have started speaking up too for the Meadows behind the scenes. Thank you to them for this. But why wait for over 2 years when they could have stopped this at the first report? We can only assume they realise now that the Redrow planning application is public, that our arguments are valid, this is a senseless project, and it will not succeed through planning if the process is properly independent, planning and heritage policies are observed. We as taxpayers and citizens have the right to expect better. At what cost to Liverpool Council will Joe keep making these mistakes – when his whole rationale is to make money? The selling price of this site will have halved already, as the number of houses has apparently dropped from 160 plus to 34 if we are to believe Joe (see Joe’s Blog below). One look at the planning application reveals the future for the site. How can Redrow or any developer NOT inevitably cut down these magnificent trees fringing the whole site, either during construction or to provide the driveways, garages and access that million pound homeowners expect? How can they guarantee the trees that are left will have a secure future, with the increased risk from utilities underground, increased traffic and proximity to large expensive houses? Elections are looming and the loss of Sefton Park Meadows and other Liverpool greenspaces is a significant local issue, with supporters even at national and international level. We may have saved the trees on the Meadows but we are committed as a campaign group to stop this development completely. After our meeting last night, we agreed a statement on behalf of Save Sefton Park Meadows Mayor To Save Sefton Park Meadows Trees 29.01.2015. We pledged to continue our campaign. 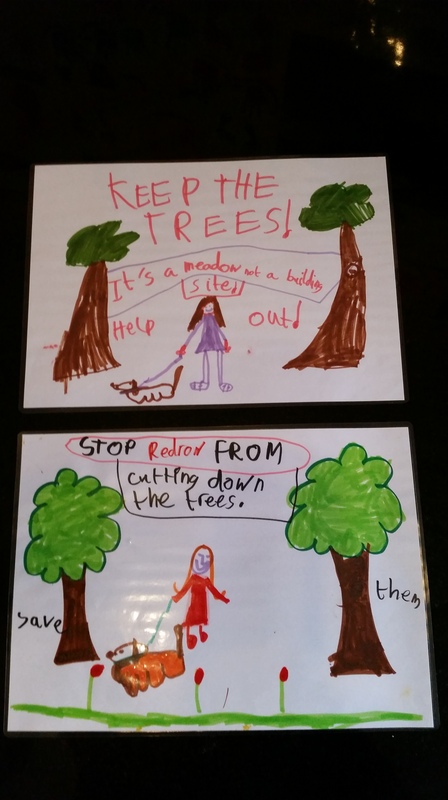 The loss of trees was always inevitable, but we say to Joe and Redrow NO DEVELOPMENT ON SEFTON PARK MEADOWS. We have today written to the Mayor, Head of Planning and Chief Executive Officer of Liverpool City Council to ask for an explanation of Joe Anderson’s action and clarification of where this leaves the current and future planning applications. We are waiting to hear…. watch this space. I am today voicing my concerns about the latest proposal from Redrow for land at Park Avenue. Like residents, I was unhappy with the number of trees that would be lost and have asked them to amend the scheme to make sure that there is no tree loss if, it all possible. There has been a lot of discussion with the developer over the last few months about meeting this aspiration, and the planning application we received most recently is the third design that Redrow have come up with the two previous schemes being too dense in my opinion. Redrow though have been very receptive to the concerns raised and are continuing to work very closely with the City Council in making sure the scheme is right for which I am very grateful. I know there is a great deal of passionate debate about this site, but I have been absolutely clear from the moment that we declared it as available for development that any residential scheme needed to be of the highest quality, of low density and in keeping with the area. We could have received more than double the amount we will finally receive if we were not so determined to make sure that the development is of a density, design and quality that is appropriate for the surroundings. It is worth reminding ourselves of the rationale for the development. Quite simply, it is to help offset the eye watering Government cuts we have faced, and will continue to face, over the next few years. The sale price of the land will provide a much-needed financial boost, and be invested in projects such as parks. The project will also help us meet the demand for much needed high-quality homes in the city, generating tens of thousands of pounds of high band council tax income to help support services. I love Sefton Park. I have used it for the whole of my life and take my grandchildren to use it regularly. So I would absolutely not approve any scheme that causes harm to the park itself. The bottom line is that the investment we are getting from the development at Park Avenue will help us, in difficult times, to continue to protect it. All the Redrow Planning Application documents can be found here. Project Packs 1 and 2 contain the detailed drawings of the houses. 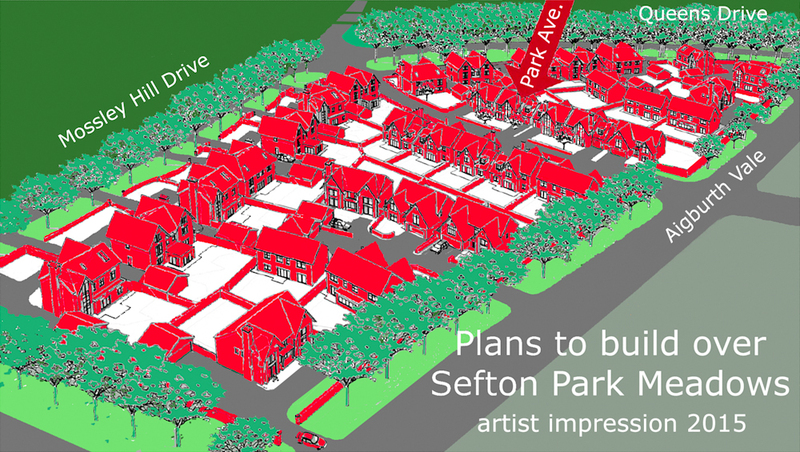 Redrow Homes NW have submitted a planning application to build 34 large detached houses on Sefton Park Meadows, which also means felling a quarter of its mature trees. The planning process can be complicated and documents can be difficult to view and get to grips with. The Redrow Planning Application has 70 documents, some over 50 pages long, including detailed drawings, consultants’ reports and technical jargon. Not easy when you can only read them all online, as no plans are being made available at Council offices for local people to view or talk over with Sheridan Scott the Case Officer. We have put together some main points that have formed the basis of our campaign objections since the beginning. These may be helpful for supporters in putting together your own objections. This is the ‘short list’ of bullet points. A more detailed ‘Starter for 10 Objections‘ is here for supporters who want more. For more info on ‘How To Object’ see this great blogsite by Martin Goodall. Please share on your Facebook and Twitter pages! 2. It is not required to meet local housing targets. 3. All brownfield land should be considered for development before any land such as the Meadows is even looked at in this respect. 4.The Meadows are part of our city’s historic public greenspace within the Sefton Park Conservation Area. 5. All trees on the Meadows, including those targeted for felling, are of a high quality and have preservation orders on them. 6.The area is within the significant setting of Sefton Park which is Grade 1 listed. 7. Sefton Park Meadows is part of Liverpool City Region’s Green Infrastructure Plan, the Liverpool Nature Conservation Strategy and is a buffer for the Nature Conservation Area in Sefton Park. 8. Over 7,000 local people have objected to the development of Sefton Park Meadows and 1,300 registered formal objections were sent to the Council. We are delivering a Objections Flyer 1 door to door to almost 800 residents who live immediately close to the Meadows this weekend (25th Jan) to encourage people to send in objections, as the council seems to be doing their best to keep this planning application quiet and its massive adverse impacts on Sefton Park Meadows and the wider Parklands. We will also continue to put up specific briefings on key aspects as we review them. Briefings 1 is on a previous post, and focusses on tree removal. Big thank you to all supporters and friends, we can win this!. All the Redrow Planning Application documents can be found here. Project Packs 1 and 2 contain the detailed drawings of the houses. 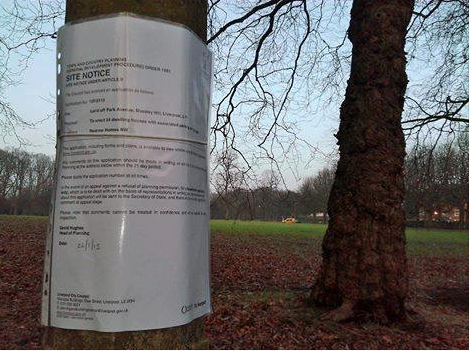 Following the publication online of planning application 15F/0110 by Redrow NW, Liverpool Council Site Notices are being posted around the Meadows today, 22/1/15, with legal details of the Redrow planning application and where to submit comments. The council Planning website also lists nearly 800 neighbour address details where Council letters are to be delivered, or already should have been delivered, to advise local residents of the Redrow planning application and where to submit comments and by what date. No reports yet of any residents receiving these letters. This Owner/Occupier template letter on the LCC Planning website is dated as 19th January with comments to be submitted by 9th February, 3 weeks later. We believe this date should be 3 weeks from when the letter is received by residents and are making enquiries about this. The Liverpool Echo Business Section on Thursday 29 January will now have a Public Notice advertising the Redrow planning application to the general public with comments to be submitted by 19th February, again 3 weeks later. In the next few days we will will post and Twitter more information about Redrow’s site plans and their impact to assist campaign supporters to make their own comments and objections. All council notices and consultation letters refer to Sefton Park Meadows as ‘Land off Park Avenue, Mossley Hill, Liverpool L17’ , which is misleading when the site is commonly known locally, nationally and now internationally due to recent publicity as Sefton Park Meadows. Some people will not be aware that the planning application for‘Land off Park Avenue, Mossley Hill, Liverpool, L17’ is actually the Redrow application for Sefton Park Meadows. Even more so when most maps show the site is actually in the L18 area, not as stated in the planning application as in L17. Watch this space for regular updates. Categories: Objections, Planning Process | Tags: council, environment, housing development Liverpool, Liverpool City Council, Liverpool greenspaces, Loss of Open Space Notice Liverpool, Loss of openspace, Park Avenue, Redrow, Redrow development Liverpool, Redrow Homes in Liverpool, Redrow NW, Sefton Park, Sefton Park Meadows campaign, Sefton Parklands campaign | Permalink. We are starting to look at the official documents submitted by Redrow for their planning application and interpret their significance and impact on Sefton Park Meadows. These new Briefings will be available for supporters to use to make their own comments and objections to the Redrow application. ” The location and uniformity of existing trees makes the creation of new access points impossible without some degree of tree loss. A requirement to prune a large number, in particular those in the southern half of the site, will change the existing character of the avenue planting in the short-term. The number of driveways Redrow plan to build under existing mature trees is also a real threat. Any tree experts would avoid this as a priority due to potential for damage to roots and trunks. Also for tree management in the longer term. Onsite monitoring during construction periods is rarely undertaken or enforced. Campaign Chair Ken Aspinall has just had an email from Liverpool Head of Planning to say that Redrow’s planning application for Sefton Park Meadows has been submitted. All of the planning application documents can be found here. The brief description refers to Redrow’s application to erect 34 dwelling houses with associated parking and garages at land off Park Avenue, Mossley Hill, Liverpool. The full application with all supporting documents does not seem to be available online. Under ‘Related Documents’ there is only a Publicity and Consultations Record Sheet. We are asking for actual details of this planning application, plans, elevations, site layout, Heritage Statement, Environmental Impact Assessment etc. etc., and when they are going to be accessible online. The Applicant is shown as ‘Resrow Homes NW’ which we assume is a spelling mistake and should read Redrow Homes NW. The Application Date is given as 15.01.2015 but the ‘Comment Until’ date is given as 13.01.2015. We assume this is another mistake. We have asked for clarification. from Head of Planning on these AND to know when the application will be publicised in the Liverpool Echo notices. We are also pressing Head of Planning for details of any pre-application discussions Liverpool City Council Planning Department have had with Redrow Homes since August 2014. THE HARD WORK OF SCRUTINISING THIS APPLICATION AND SUBMITTING STRONGLY ARGUED OBJECTIONS IS ABOUT TO START. We will be contacting our professional planning consultant to begin his work now. Everyone of our campaign group and you supporters out there will be needed to stop this Redrow development of Sefton Park Meadows. Meadows campaigners will be lobbying outside the next full Council meeting, together with other Liverpool green space campaign groups. Please come and join us! Council meeting starts at 5pm. This is the last full Council meeting until April and an opportunity to show the strength of feeling from all save green space campaign groups. Categories: Objections, Planning Process | Tags: campaign, conservation, council, disposal, environment, green, health parks, housing development Liverpool, Liverpool City Council, Liverpool greenspaces, Loss of Open Space Notice Liverpool, meadows, Park Avenue, Sefton Park, Sefton Park Meadows, sell off Liverpool | Permalink.